As any runner will tell you, there comes a certain point when you’re doing those long distances or challenging trails, where you’re faced with the worst adversity that a runner can face; a wave of extreme tiredness, sore muscles and sometimes even fuzzy brain. However, on the other side of that wave is “the runner’s high”, a state of euphoric energy so intense that it powers you to cover even longer distances than you would’ve ever thought possible. This process happens due to the activation of certain endocannabinoids in the brain, which is why it only makes sense to consider cannabis as a viable supplement to enhance one’s training regime. 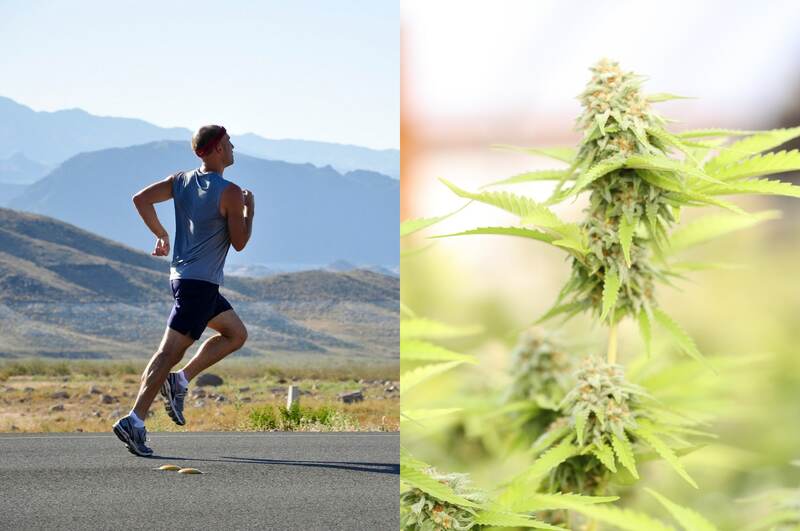 Supplementing the endocannabinoid action that’s naturally produced by the body with the healing benefits of marijuana and running will only serve to benefit your endurance and training capacity. The best part is that you don’t even have to smoke cannabis anymore in order to get its benefits. Cannabis is now available in topical form, as an edible, tincture and vaping oil. We don’t care how advanced a runner is, he or she is bound to experience “off-days” in which the prospect of putting on their running shoes seems like the worst thing in the world. This is usually due to a lack of sleep, stress, or other factors. You can either keep pushing the snooze button on your alarm clock while fighting the urge to quit, or you can just give yourself an instant boost by taking a potent hybrid strain of marijuana. Hybrid strains give you the best of both worlds, as they offer a balanced yet effective high that boosts your energy without leaving you feeling drowsy later on. Cannabis-infused topical creams and salves work like magic to get rid of muscle soreness and the inflammation that often comes after a long workout session. That way, runners can get back to doing what they love without worrying about sore muscles and tired limbs. Not only do these topicals come in a variety of forms including creams, salves and lotions, but they’re also beneficial for sensitive skin which means that they’re suitable for all skin types. Unlike homemade cannabis-infused brownies that come with an uncertain dosage of the substance, cannabis edibles feature low dosages that enable you to control how much you take at any given time. This enables you to enjoy all the energy-boosting benefits with none of the excess sugar. Need a mid-run pick-me-up? Just pop a piece of cannabis-infused and sugar-free chocolate into your mouth and enjoy the burst of energy it gives you to finish the race strong. Sometimes runners challenge their bodies so much that it becomes difficult to sleep when they need to, due to sore muscles and/or aching joints. In such cases, a good dose of an Indica strain is just what you need to help you achieve a restful and rejuvenating sleep that will make you feel like a million bucks and eager to go come competition time!